Earth sheltered home for sale in Coeur d'Alene Idaho. 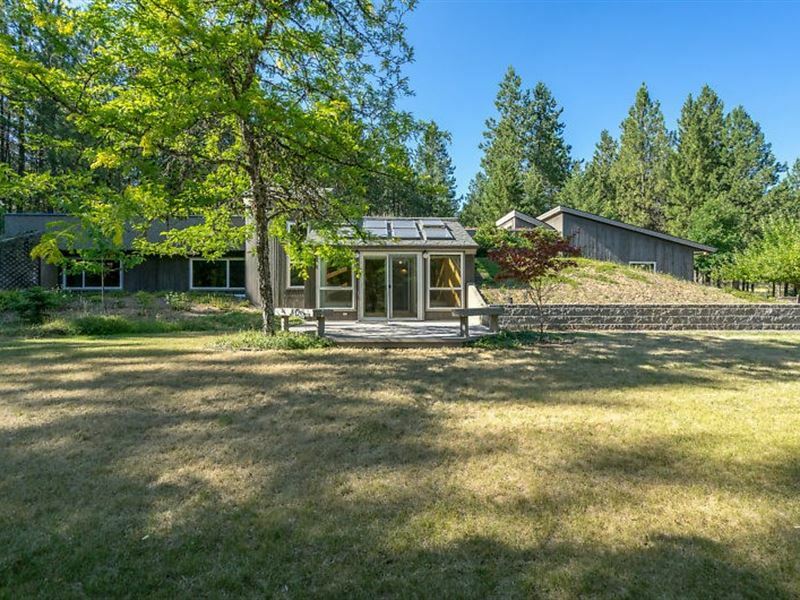 This energy efficient, earth sheltered home on 11 acres in Cougar Gulch neighborhood, located in Coeur d'Alene, ID. This proeprty boasts abundant wildlife, turkey, deer, elk. Lots of surrounding hunting land, and close to public lands. Blackwell Island Marina on Lake Coeur d'Alene just minutes away. Enjoy Cougar Bay Preserve with walking trails. Located off Hwy 95 just south of Interstate 90 in Coeur d'Alene, ID. Close proximity to Spokane International Airport and Coeur d'Alene Regional Airport. Uniquely designed skylights provide natural light inside the home this in addition to a south facing sun room which offers plenty of sunshine. One owner, well constructed home with attention to detail. 30 x 50 insulated and heated shop with full bath, loft and two enclosed work areas. Partial fencing with remote operated driveway gate. Shop offers built-in shelving in work areas and in loft. A 25 gpm private well, 80 gallon storage tank and filtration. Greenhouse is situated on a foundation with water and electricity, fenced garden area, garden shed and mature fruit trees. This 3 bedroom 2 bath home is located in a beautiful rural setting with mature timber trees and plenty of privacy. Neighborhood offers beautiful homes on acreage all just minutes to Downtown Coeur d'Alene, Id. Access this property on a county maintained school bus route road, to Dusty Lane.